When Escondido Falls is flowing strong, it is flat out one of the finest waterfalls around Los Angeles. The waterfall has an easy-to-reach lower tier that is 50 feet tall and a hard-to-reach upper tier that’s 150 feet tall and stunning in optimum conditions. Escondido Falls is one of the Los Angeles waterfall hikes. The 3.8-mile round trip hike to Escondido Falls begins just off Pacific Coast Highway and goes uphill for 0.75 miles along Winding Way, a paved road that passes extravagant Malibu residences. Do not let the blacktop deter you. The waterfall is well worth the hike’s unconventional start. After gaining almost 200 feet, the road heads downhill and arrives at Escondido Canyon Park, a wooded park that is open for everyone to enjoy. Take the dirt path to the left next to a sign that reads “Edward Albert Escondido Canyon Trail and Waterfall.” The trail descends through a field of fennel and mustard toward a thicket where a small creek flows. Cross it and make a left turn to head upstream into Escondido Canyon. The trail widens and remains fairly level as it passes through forest and fields. In the spring, wildflowers bloom in abundance along the trail. A few creek crossings interrupt your progress. When the water is high, they require a bit of fun rock hopping, but otherwise, they are easy to cross. Over the course of one mile, the trail gradually ascends over 150 feet from a low spot below Winding Way to arrive at Lower Escondido Falls. This fifty-foot cascade transports hikers instantly to the tropics. A mild sulfuric smell is the only detractor from this soothing setting. Have a seat next to the fern-lined falls. For many hikers, Lower Escondido Falls is a fitting destination that can be reached with ease. For those yearning for more and willing to work for it, Upper Escondido Falls is three times as tall and ten times as beautiful. A route to the right of the lower falls provides a way up the steep limestone wall. The path can be tricky to get up, and coming down is a slippery endeavor. Wear proper footwear and dig in for an adventure up to the upper falls. Use the roots for support and make your way upward. 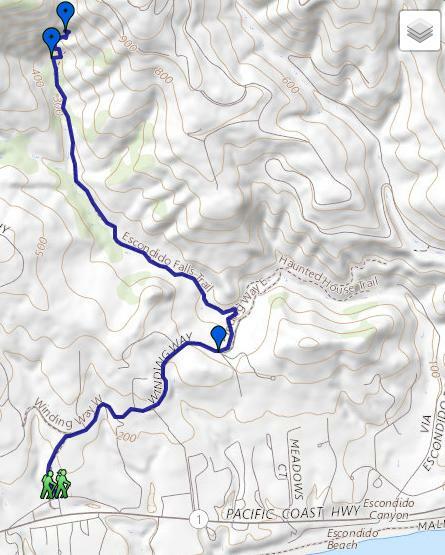 A stretch of rope may be available to help with one portion of this steep section of the hike, which gains close to 200 feet of elevation over 0.15 miles to reach the base of Upper Escondido Falls. Catch your breath as the path turns to the left and crosses the creek beneath a cascade above Lower Escondido Falls. Stay on the left bank of the creek from here, passing over roots and boulders to find the impressive upper falls. Upper Escondido Falls is a true treasure. The water pours over a wall of lush green moss and falls some 150 feet before landing in a calm pool. If Escondido Falls has a good flow of water, it is one of the best around. You might see a few hikers climbing up to a small landing behind the falls. If you are prepared to get wet, this precarious venture adds even more fun to the hike. The view from behind the falls is a treat and so is the fresh mint that grows there. Your safety is your responsibility. Attempt at your own risk.